It has been exactly 138 days since I last set foot in a gym. In other words, 19.7 weeks, or 4.6 months. I know this specifically because I went to the gym the day before I was admitted to hospital with a 14cm mass in my chest. In retrospect, a moderate elliptical workout when there are veins protruding from your neck is NOT a good idea. But going to the gym was just a part of my day. It was a habit I spent a long time establishing and became one that was not easily broken. I bring this up because I’ve been thinking about the gym a lot lately. When I first got sick, exercise of any kind was the furthest thing from my mind. I was on bed rest in the beginning, so walking wasn’t even an option. By the time I started chemotherapy, the cancer was pushing on my lungs and making me short of breath. The biggest roadblock so far has been the fact that the most active part of the cancer is wrapping itself around my superior vena cava – one of the main veins that brings blood into my heart. I have to be careful when I get my heart rate up and blood pumping because that area is being squeezed. Even though I was a self-professed fitness fiend (so much so, I even turned it into my work as a personal trainer! ), giving up fitness has been strangely easy for me. I still try to move my body every day for the sake of keeping it healthy for treatment. Since getting Buster, I like to save my energy for dog walks lasting 30-90 minutes each day depending on how well I’m feeling. But for the most part, I haven’t spent much of the last 138 days missing my old fitness routines and active lifestyle. It’s actually been a nice break to be lazy for a while! That is, until recently. Over the past few weeks I find myself daydreaming about how I’m going to learn to run again, what kind of exercises I want to focus on to get my strength back, and even rejoining the gym. The trainer in me is thinking up schedules and plans to get my fitness level back up when this chemo thing is over in two months (so long as I don’t need radiation after). It’s nice to feel that motivation again, and start to feel hope that maybe, maybe, I’ll be healthy enough one day to take on an active lifestyle again. Apart from the cancer and chemo business, I still have more roadblocks to get through until I can get there. There is of course my broken arm, which surprise, is still broken! I’ve gained a lot more mobility with it over the past few months, particularly with rotating my hand. But I’ll never be able to straighten my left arm fully, and I still can’t put any weight on it. I mentioned before that I took a gentle yoga class a few weeks ago. While I could do most of the movements, I was still very limited with my arm. Sun salutations and downward dogs are officially out of the question for me, most likely forever. Upper-body strength training will always be a challenge. On top of that, there’s the new development of lung toxicity. The chemo poisoned my lungs and I’m experiencing decreased lung capacity because of it. I’m on Prednisone steroids now which have helped with the coughing and shortness of breath a lot. Before, I couldn’t get off the couch without gasping for air. Now I can at least yawn without breaking into a coughing fit. Next week I will start the two month process of weaning myself off the steroids, so hopefully the symptoms won’t come back. I’m also going to start seeing a respirologist to help “rehabilitate” my lungs. Here’s hoping the damage to my lungs is reversible and that they’ll be able to withstand running again someday! I know full well that I won’t be back to my “old fighting form” as soon as all of this is over. I have learned too much throughout this experience that I don’t desire the same sort of vanity fitness goals I had before. The trainer in me is instead considering my roadblocks and thinking of ways to work around them to still have a healthy, happy, post-cancer, post-injury body. Cube and brown 4-6 chicken breasts in a pan. 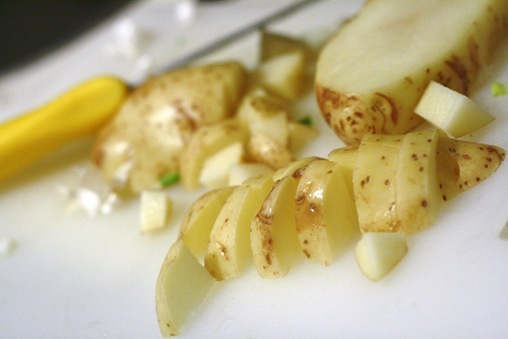 Cube 2-4 medium sized potatoes, slice 2 small onions, and add them to the slow cooker. 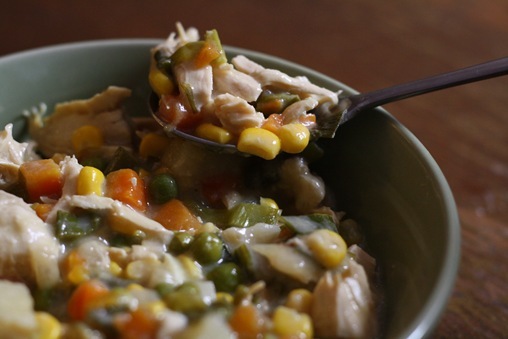 Add chicken and sauce to the slow cooker, cooking on low for 9-10 hours, or medium for 6. 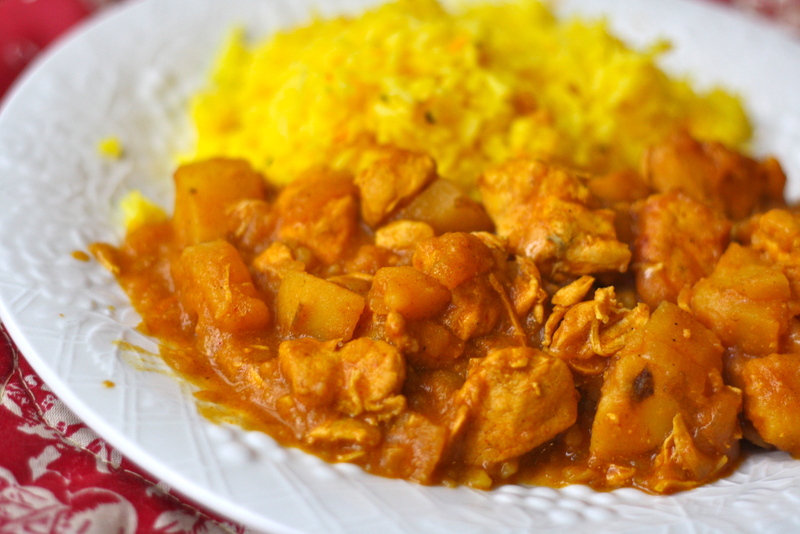 This is not a super spicy curry, despite all the curry powder (which isn’t very spicy to begin with). Just enough heat to make your nose run a little, but all the flavours are able to shine through. The rice was an extra special treat. 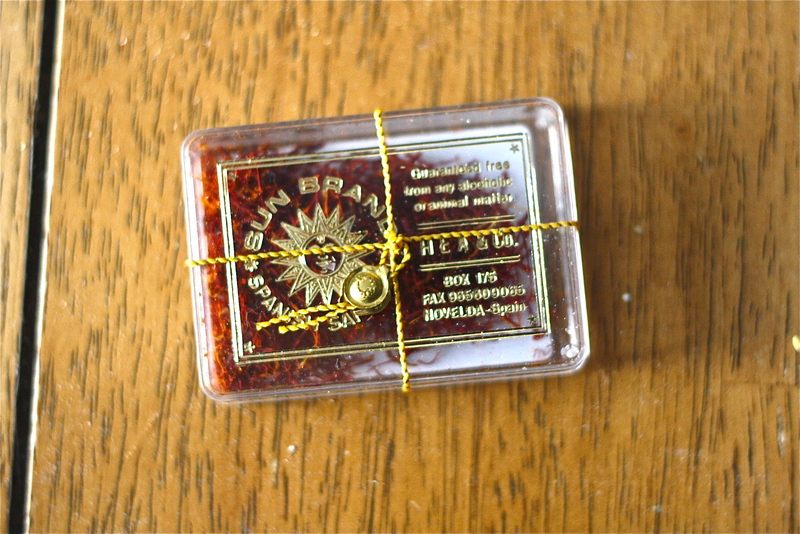 I finally cracked open the saffron I brought back from Toronto! I’ve been hoarding this and knew it would lose its flavour if I didn’t use it soon. This little box cost $10! I used this recipe with the addition of 1 tsp parsley flakes and 1 tbsp salted butter instead of fish sauce. It was perfect in every way. Now, I will admit that it is sometimes really hard to sit back and watch people around me do the activities I love. I’d be lying to say I don’t feel a pang of jealousy when I see a runner out on a gorgeous day, or hearing about the fitness goals and accomplishments of others. Seeing as I can’t currently do most things fitness related, my interest in it has kind of plummeted. But I keep reminding myself that this is my time to heal. I am currently doing what is best for my body, which is completely different than what is best for someone who is in a different stage of their life. Fitness is not a linear path. It’s all about the ups and downs and dealing with the roadblocks as they come. I am trying really hard to enjoy my lazy days with 90210, the slow cooker, and casual walks, while using my daydreams of fitness routines at the gym as something to look forward to and work towards. Because I now work mostly in the afternoons and evenings, I find myself doing all my food preparation in the mornings. Things that I can quickly zap when I get home, or will carry well in a tupperware container to work with me. 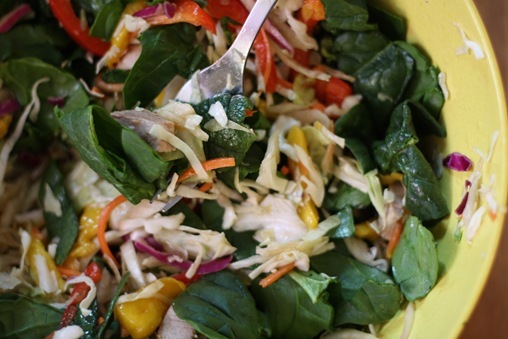 Even though it’s the dead of winter, I find myself cravings salads. The kind that get better after a day of sitting in the fridge. Even better, the kind that can be frantically eaten cold in between training clients or my second job. Because I am the Queen of Wasting Time on the Internet, I went through 101 chicken recipes on the Cooking Light Website. 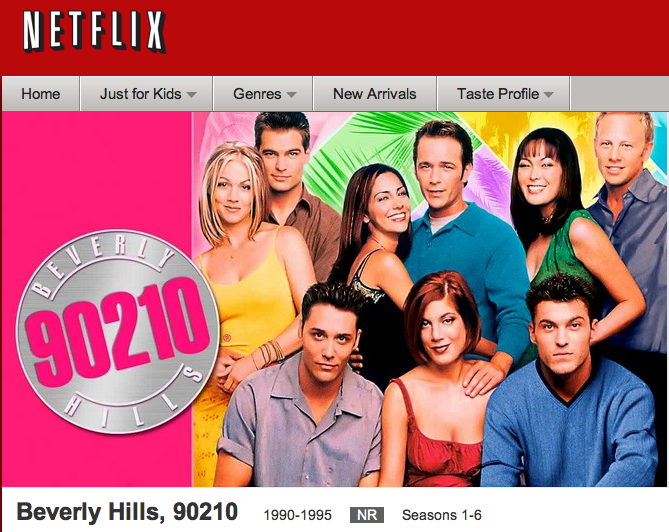 Yes, this is how I make use of my not-so-spare time. 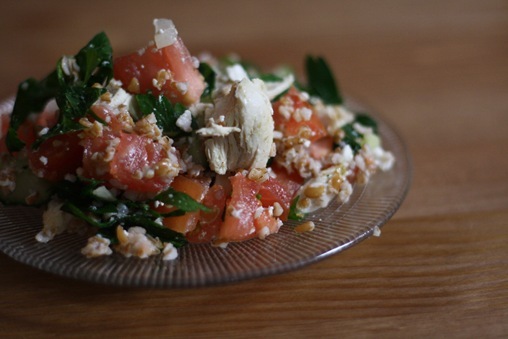 Of all 101 recipes, this Chicken and Feta Tabbouleh recipe was one of the few that really stuck out. 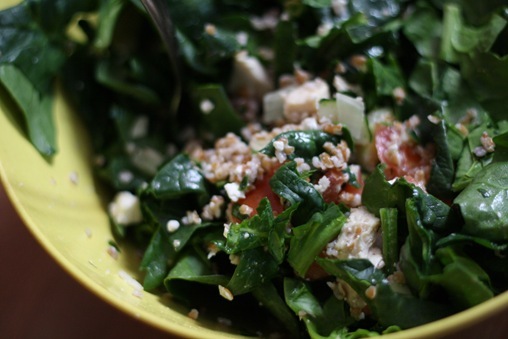 Grains, protein, vitamin-packed parsley and feta for a little kick. Perfection. 1/4 cup chopped fresh mint omitted because I couldn’t find any! 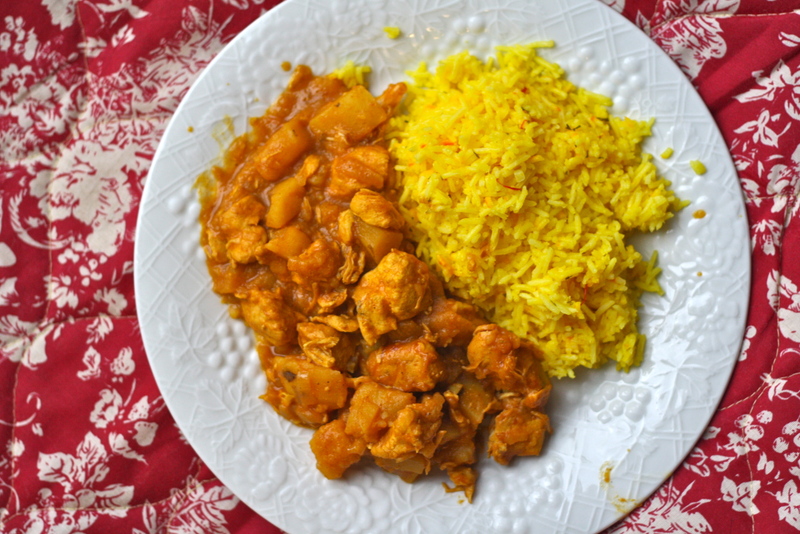 It looks like I made a lot of changes to the recipe, but I actually kept the key steps intact. It’s got the perfect amount of parsley and feta so that it doesn’t overpower everything. 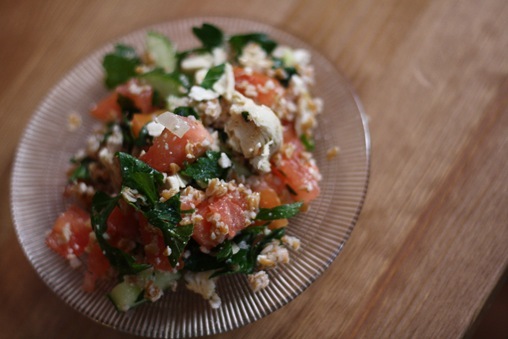 And it’s got way less oil than most tabbouleh recipes, without feeling like it could have used more. I of course ate it on top of a giant bed of spinach, as I do with most leftovers. Plumps up the dish to make me feel like I’m eating a lot more! 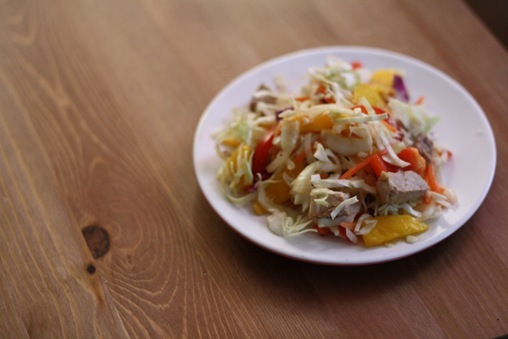 For my next salad, I was inspired by this mango slaw I made over the summer. Except this time I really want to bring out the “Asian” flavours. Cook the pork chops in a frying pan until no longer pink in the centre (they’ll turn white as they get more cooked). Be sure not to overcook them – they cook quickly and dry out easily! Meanwhile, assemble everything else in a big bowl. 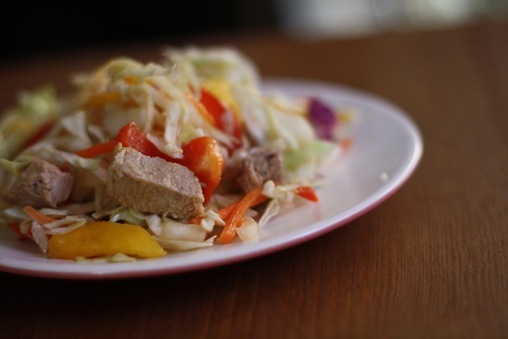 Chop up cooked pork into little pieces and toss together. Tastes best after sitting in the fridge overnight. Not to toot my own horn or anything, but I make really good coleslaws. Or maybe I just really love coleslaws. 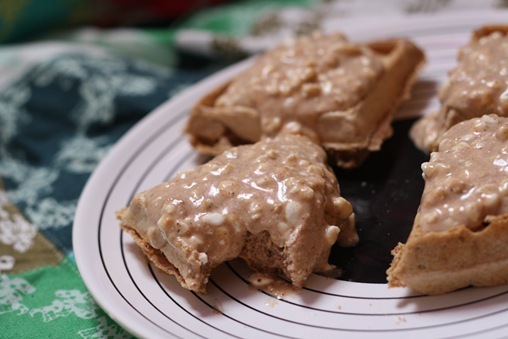 You can’t go wrong with this flavour combo, and it was a total cinch to make at 10am! Yup, I even eat my coleslaw on top of spinach. Gotta build up those Popeye biceps. Even though my meals have been cold lately, I’ve been keeping toasty with lots of warm drinks! Warming up in coffee shops with friends! 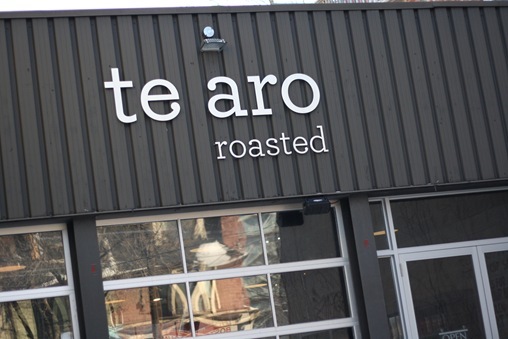 When Morgan and I decided it was high time for a coffee date, I immediately suggested Te Aro. 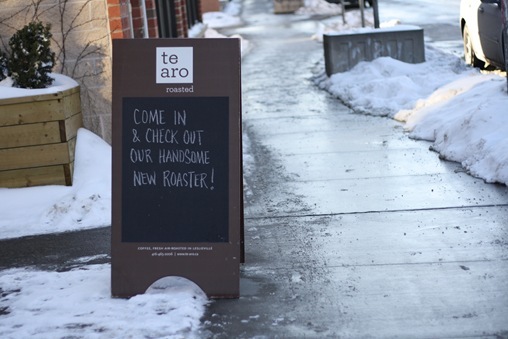 A cafe in my ‘hood of Leslieville that is always being listed as one of the best in the city. They roast they’re own coffee here. 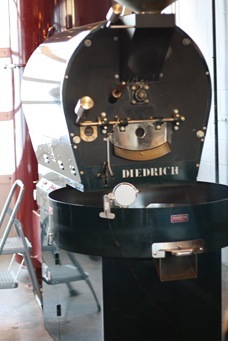 A neat concept to me as back home local roasters are hard to come by. 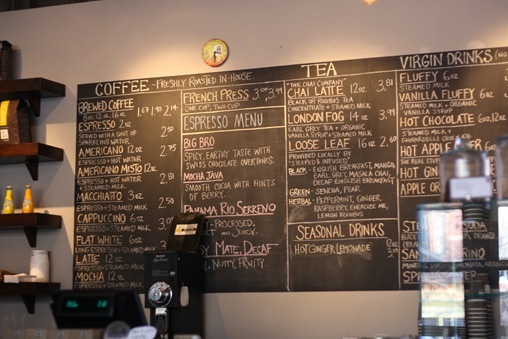 Nothing overly exciting on the menu board, just the classics. So I decided to find out just how well they do a classic. I ordered what they call a “Flat White.” A long espresso with a dash of steamed milk and foam. 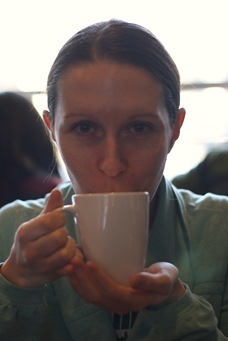 As I told Morgan, I like to judge the quality of espresso based on how much sugar I want to put in it. 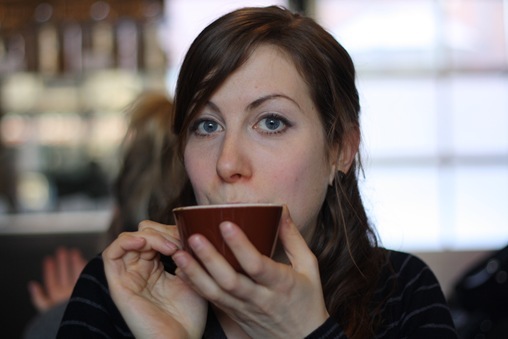 Good espresso is rich and caramelly and doesn’t need a hint of additional sweetness. And this stuff went down smooooth. Thumbs UP! 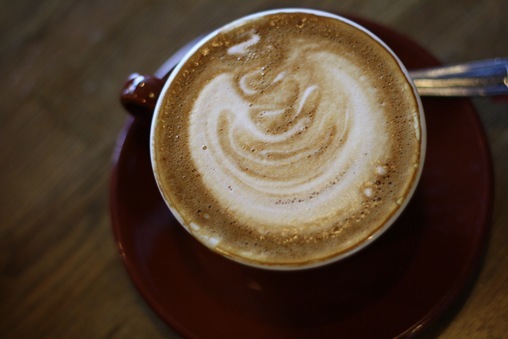 Question of the Day: What’s your favourite thing to order in a cafe? I think I’ve asked this question before, but I want to know again! I always love long espressos or espresso macchiatos. I don’t have an espresso machine at home so it’s always a treat! Best breakfast of the week. Yup. Even better than all those fancy brunches. Well, minus french toasted pastries and giant pancakes. But you get my drift. 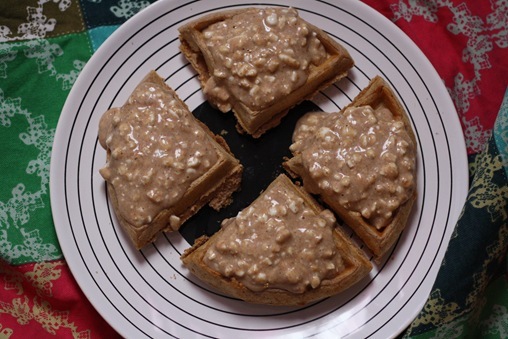 Today’s topping consisted of 1/2 cup cottage cheese, 1 tbsp peanut butter, 2 tbsp sugar-free syrup and cinnamon to taste. 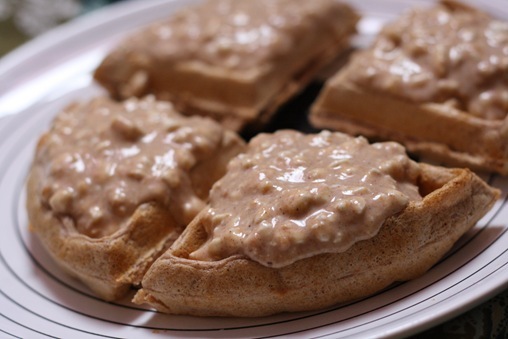 A cinch to whip up and completely delicious! Also, a nice break from the oatmeal and egg sandwiches I’ve been eating lately. After yesterday’s indulgent pie recipe, I decided it was time to balance things out with a non-pie. If you don’t have any leftover poultry to use (my mom often makes this with turkey leftovers) start by boiling your chicken breasts until just cooked. I used two very big chicken breasts – around 12-14 oz all together. 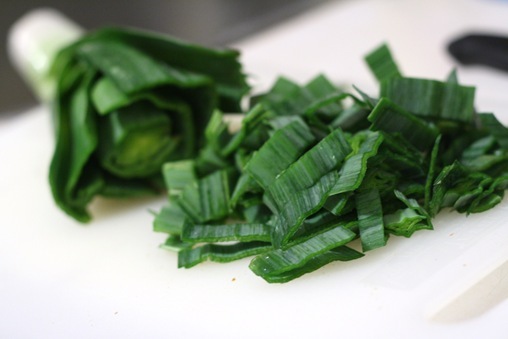 While that’s going on, chop up one leek. Around two cups worth. 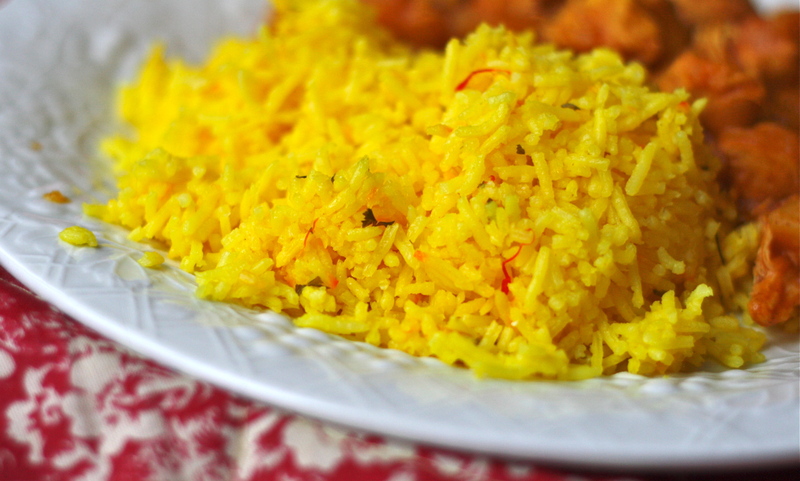 Cook it in a greased frying pan along with 1/4 cup onions, a clove of garlic and a quarter teaspoon of dried thyme. Potatoes! Two of ‘em. The key to any homestyle dish. Y’all know I’m a fan of the frozen veggies. 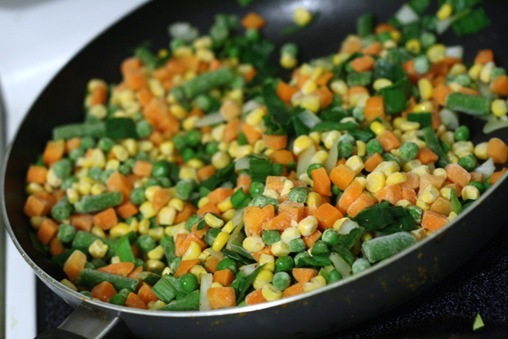 I added a 500g bag of a carrot, corn, pea and green bean mix. But you can add any veggies you like. Mushrooms, parsnip or turnip would be great too. Around 2 cups worth. 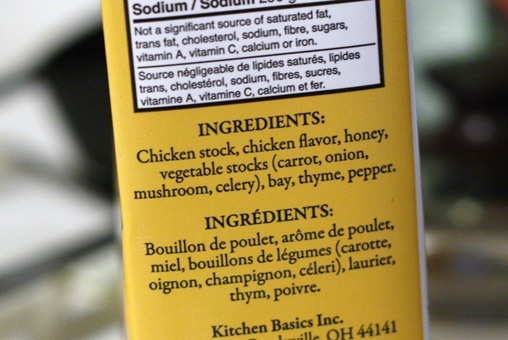 I also have an abnormal fear of store-bought broths. I think it’s because at one point my doctor told me I could have an allergy to monosodium glutamate (MSG) and a lot of broths have it. 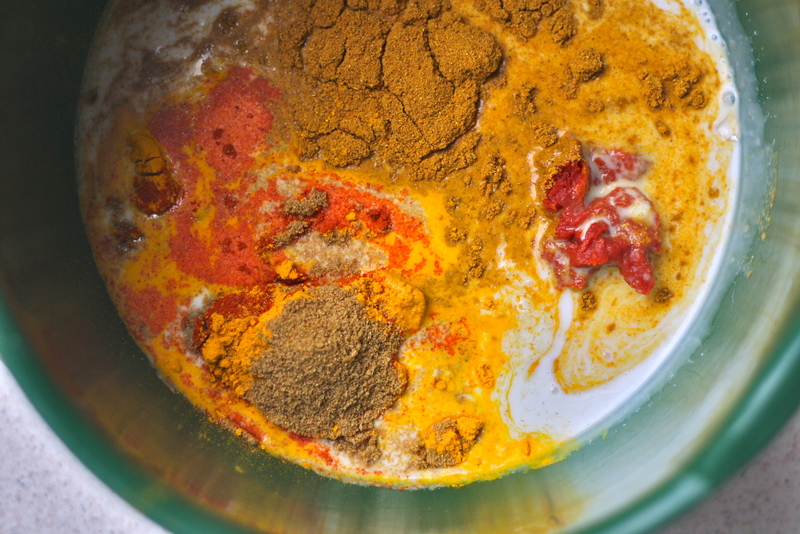 Turns out I just have an intolerance to certain raw fruits and veggies – but the fear stuck! By now the chicken should be close to done, so just drain it and set aside to cool. 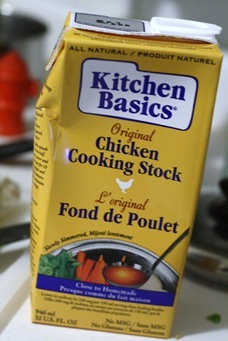 Meanwhile, mix 2 cups of the chicken broth with 1 cup low-fat milk, 3 tbsp all-purpose flour and a squirt of dijon. Whisk baby whisk! It takes around 10 minutes to get thick. 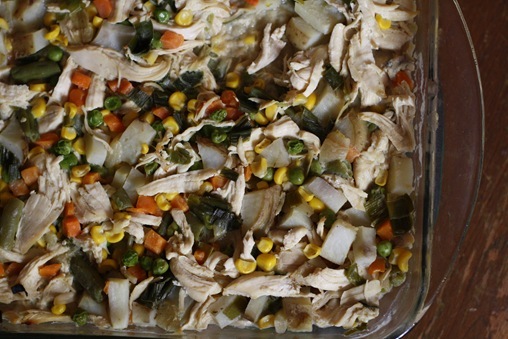 Once your hand is cramped from whisking, and your veggies are off the burner, shred the cooled chicken and combine everything into a large casserole dish. Cover with tinfoil and bake at 375 for around 45 minutes or until potatoes are cooked. Voila! Chicken Not Pie. Who needs pie crust or biscuits? More importantly, who has the patience to make pie crust or biscuits on a weeknight? Not this girl. 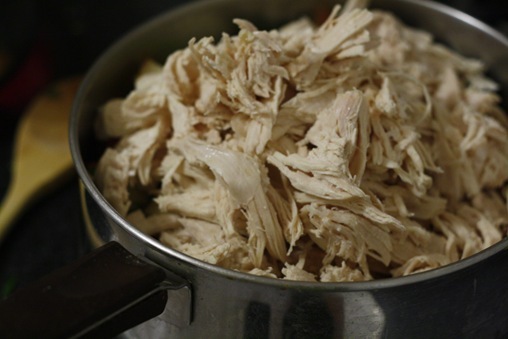 Boil chicken breasts in a large pot of water. Cook leeks, onions and garlic in a pan until soft. 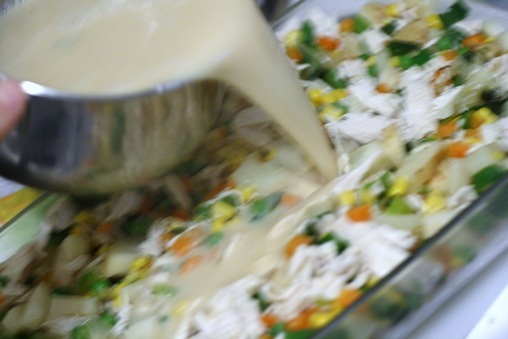 Add potatoes, spices and frozen vegetables. Once chicken is cooked, set aside to cool. 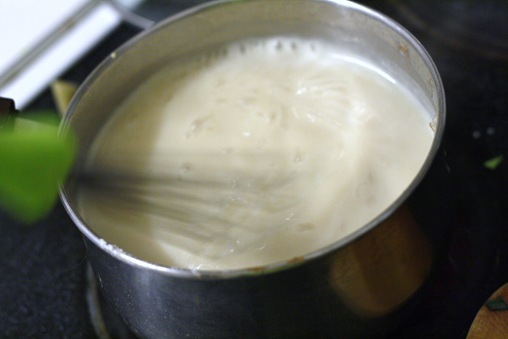 Add broth, milk, mustard and flour to a small pot and whisk on medium-high heat until thickened. Around 10 minutes. Once chicken is cool enough to touch, shred it with your hands. 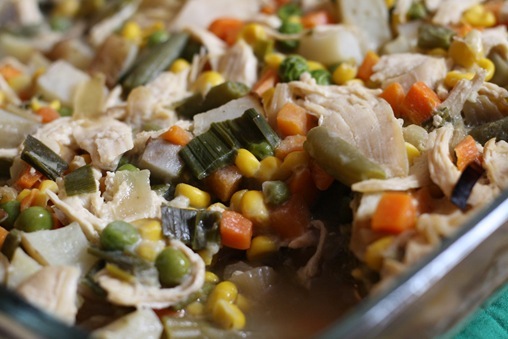 Mix chicken with veggies and add to a large casserole dish and pour broth mixture over top. Cover with tinfoil and bake at 375F for around 45 minutes or until potatoes are cooked. 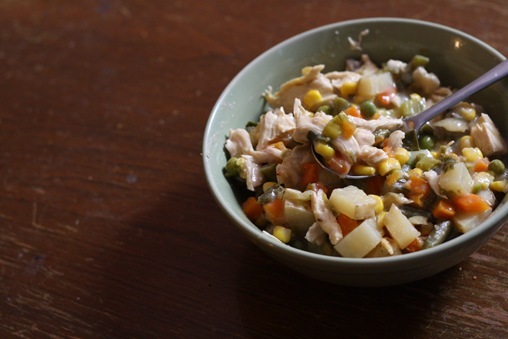 Even better than the warm, comforting taste are the nutritionals! Each serving has 273 calories, 3g fat, 33g carbs, and 28g protein. I ate my bowl with a side of some carrot sticks and apple slices, because I eat everything with a side of carrot sticks and apple slices. OR, if you’re really smart, you’ll follow up your Chicken Not Pie with a piece of Fluffernutter Pie.